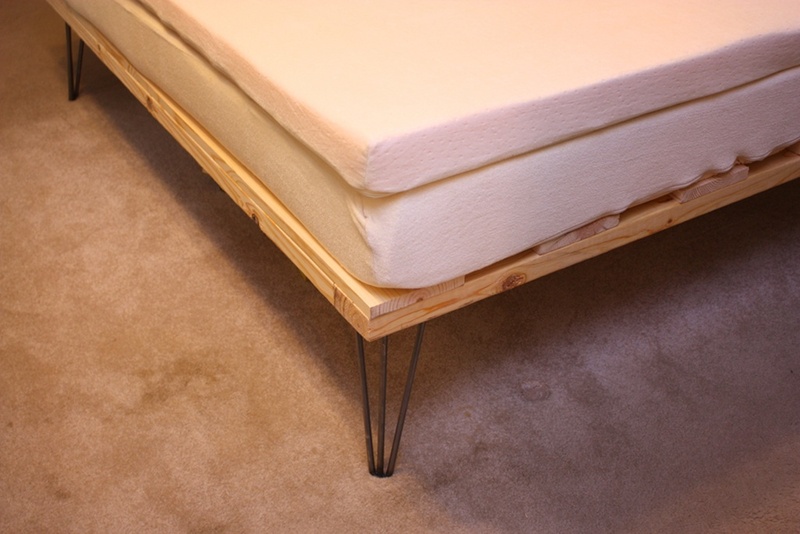 I received a comment on my DIY Memory Foam Bed post recently asking for plans to our pine platform frame. I didn't go into much detail with that post because we were planning on replacing that frame with a homemade oak frame by now. But we haven't felt in a rush to replace it. It serves its purpose, I can store more stuff underneath than before, the bare pine doesn't offend me at all, and we can devote our time to other projects. So here's the lowdown. Be warned, this is not in any way a slick post (are they ever) but I wanted to respond in case a reader was desperate for a weekend project and really couldn't find plans on the web that are better than mine. This frame is for a queen sized mattress. Sorry there aren't more photos, but as soon as the bed was set up, it became a purgatory for unfolded laundry during the day, and I'm not commemorating that with images. and 2 - 53"lengths for end pieces. Cut 1x6s into: 8- 60" lengths for slats. Lay 1 slat along the 2x4 end pieces at the top and bottom. Use 3 cabinet screws, one at each end and one at center, to secure each slat to the 2x4 beneath. Once the top and bottom slats are screwed down, turn the whole thing upside down. 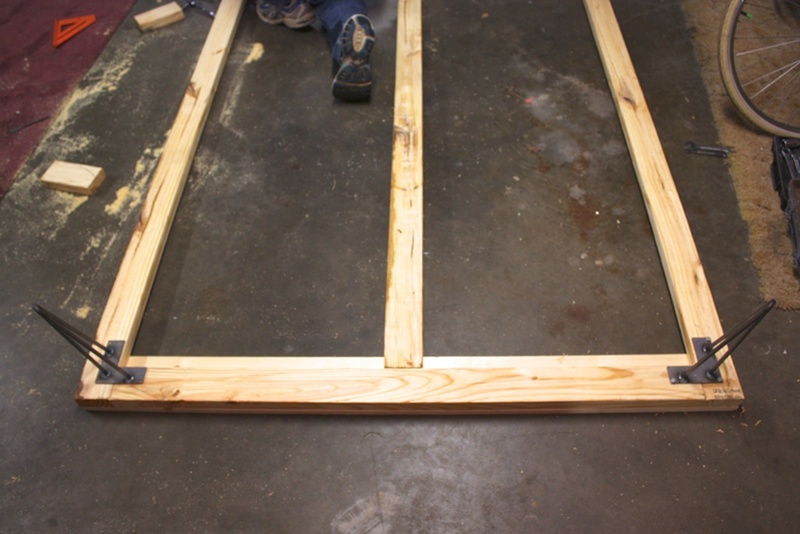 Set the legs onto each corner of the frame (as in the picture above) where they will be attached and mark for the placement of the bolts. Use your hex bit to pre-drill holes for the lag bolts. Turn frame right side up, make sure it sits evenly. Lay out other slats, evenly spaced, over the top. Use three cabinet screws to secure each slat at ends and center. Once mattress is on bed, tap 3- 12" 2x4s into place in center of each of the frame's vertical 2x4s to prevent sagging, so your cat can safely hide from company under it. This is absolutely a good weekend project. Like I said, my husband did this in an hour, flat. Though we will probably replace it, everyone who sees it really likes it. Two things that may reduce the need for additional 2x4 support might be changing the placement of the legs or using a harder wood, like oak. However, some of the nice diy beds I've seen still have 2x4s hidden underneath, in case. Check out my Pinterest for some other ideas and ways to modify this. Some are solid platforms, but I read that slats are better for letting latex "breathe," plus I like the look. Hope this helps. I wish I had your skills - what a great idea. Well, Jamie, I drew up a picture of what I wanted, but my husband is the one who decided on materials and put it together. He's the one with building skills. My wife and I were thinking about building this frame for our new queen memory foam mattress. How has the pine bed frame held up? We are contemplating spending the extra money for a hardwood if necessary, but prefer the raw look of the pine. Any suggestions? It has worked fine. We have not rebuilt it yet, instead we've focused on other projects. I would suggest you make sure your memory foam mattress is meant for a slatted frame as I think some are not. Otherwise, we like it. Now, we do still have the little 2x4 center supports that we added because I feared the bed falling on our cat. I still don't know that they were even necessary. With a different wood, they may not be. Good luck! Post a flickr link, or something, in the comments if you ever do try it. I'd like to know how it worked out. How stable is it with 4 legs? Do you think this could be modified for a King if a total of 8 legs were used and 3 center supports 2X4's instead of 1?